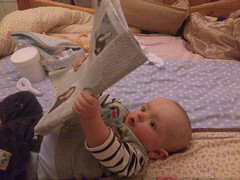 Bernie Goldbach in LSAD Clonmel | Photo of my main news reader. BECAUSE OF FAILINGS in mobile consumer space, several first movers have made the decision to launch web-first and charge directly from the gate. That's the story with me and App.net. Fred Wilson started the meme of the month about way venture capitalists are much more rigourous about pure consumer plays in mobile offerings. The smart money--in fact, probably the only money--sits with products that don't lead with a free mobile service. A lot of the failings in mobile-generated revenues lies with the low monetisation a company can make purely from advertising. People want free apps and they want free content and they depend upon free web services. But these same people don't click and purchase from the free advertising running alongside the content and services. The internet is not free. Most mobile phone owners know that as they try to remain within the data limits of their operator-subsidised handsets. The revenues of app service providers show those mobile phone owners don't want to pay by clicking on advertisements that clutter up their screens. 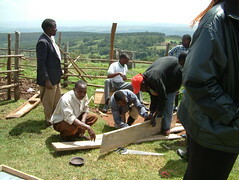 Bernie Goldbach in LSAD Clonmel | Photo of real construction we did with an African building team. DAN YORK ASKS, "Can a blog post be a work in progress?" I think he's seen a few thousand of my posts. I read Dan, and listen to him on the For Immediate Release podcast. He wonders if we are "stuck with the mental model of blog posts as pieces of content that are just published and then not touched again." I don't think that way. In fact, I know I don't tell the whole story when I blog and that I often expand my blog posts with audio posts or photostreams. Plus, I also blog about things that I need to get, hoping to receive comments from readers and listeners. Right now, I need advice on a 90W power adapter for my Dell Precision M2400. If everything works out right, my blog (or my Audioboo or my tweet) will elicit a response. Bernie Goldbach in Limerick School of Art & Design | Screenshot of Audioboo Listens. THERE IS NO WAY I can listen (or read or view) all the high-quality flow of information in my life. But I don't turn off the flow. I enjoy listening to real voices across the internet, using clever applications like Audioboo and PocketCasts. I try to keep more than 48 hours of audio commentary cached on my iTouch because that amount of content will get me over and back to the west coast of the USA from Ireland without downloading more MP3s. And I know I normally don't listen to most of the content I download to my pocket. I also don't read most of the 1212 newsfeeds in my aggregator. I don't read most of my e-mail (because I'm oversubscribed to professional mailing lists). I never check my voice mail. I don't feel obliged to answer ever doorbell. I don't pick up every phone call. I make these decisions because I do not want to be enslaved by technology or by routines suggested by others. I learned back in the 80s that email is a trojan horse that can subvert your priorities. Same for a lot of my voice mail. I heard some interesting advice from RaqiG about listening and have put her soft-spoken guidance below into my "essential listening list". Bernie Goldbach enjoys getting things done via asynchronous exchanges from clever people. VOICES IN MY EARBUDS ask about the merit of conversations in circles. These voices often lead into Google Plus. I have a little routine with Google Plus that involves looking at the white number in the red box above my Gmail account. The number is usually between three and eight. The numbers indicate activity shared by people I follow. Sometimes the numbers indicate someone new has followed me. I glance at the names, locations, and images to decide whether I want to follow someone back. Most days, a few of the numbers lead to threaded discussion on places I've commented before or on my own stuff where comments have become a threaded discussion. I'm also using G+ to listen to people talk. 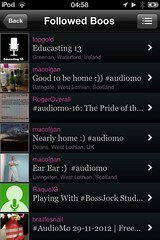 Most of that audio is from the Audioboo community. Some of the voices are podcasts that appear both in G+ and my iTouch subscriptions. In the months ahead, I plan to push out three minute audio clips from art-making sessions in a local primary school. Hearing those young and Irish voices in circles will be one of the most delightful uses of social media that I have ever facilitated. I HAVE ISSUES with O2-Ireland's standard billing fees for 3G broadband because if I use the service as my primary data connection, I exceed my allowance before half the month is finished. I run both O2 and 3Ireland MiFi service in my daily routine and rack up at least 25 GB of data usage over the air. Once I use 15 GB with O2, any additional broadband usage costs an inordinate amount of money. As the screenshot shows, O2 charged me a fee equal to an entire month's broadband for two days of service. Part of my O2 usage pattern is a tribute to the powerful upstreaming service offered by O2. The O2 mobile broadband service is well worth the contract but it simply is not fair to set power users up for bill shock because of a fee schedule that is designed to extract immense profit from known usage patterns. I HAVE SIX YEARS of opinion about Twitter and I have achieved browned-off status with it. I simply don't feel the same community spirit when using Twitter 2012. A lot of my personal observation--shared by some folks I follow--stems from discovering other time sinks that deliver more impact than time spent on Twitter. That said, as a pure time distraction, Twitter still ranks as one of my Top Five procrastination toolsets. I use several tools that drill into Twitter to give me a heads-up on news, events, long form reads, music, and trends. But I have discovered I get more accurate long range analysis and deep diving content by leveraging other social networks. And because I know there is greater business intelligence (for my interests) elsewhere, that is why my activity level on Twitter has downshifted every month of 2012. Early next month, on the sixth anniversary of me signing up as a Twitter user, I will share what I'm doing instead. But I will feed that info into Twitter, not unfold my conclusions through a series of tweets. And that, in one simple process, is testimony to how I am browned-off by Twitter. From FIR Correspondent Dan York comes news of Amazon in another kind of publishing game. As if companies and brands don't already have enough places to establish their presence online, now comes word that Amazon.com will let you create a URL with your brand name where you can promote your products and other information. You also will be able to create "posts" for your page similar to a Facebook Page. Amazon spells out more details in the FAQ for "Amazon Marketing Services", including the fact that these pages are free to create and that there is a verification process for brands. It notes that in building your Amazon Page you have a choice of three templates - and that Posts can also be cross-posted over to Facebook after you link your Amazon Page to a Facebook account. It also notes that there is "Amazon Analytics" to show you the interaction with your page. I have not yet explored setting up a Page myself, but I can certainly see the value for any company selling merchandise through Amazon. I expect we will see a rush for brands wanting to own their own brand name at amazon.com. For marketers this becomes, though, yet one more place to potentially establish a presence. We will leverage this Amazon service to promote Kindle products we're making in an e-publishing module I teach in Ireland. Bernie Goldbach in Clonmel | Dylan the reader in Cashel. SELECTED STUDENTS IN BOTH the creative multimedia and business office management courses at the Limerick Institue of Technology (Clonmel campus) will start 2013 developing hyperlocal notes from emigrants. It involves storytelling in print, sound and screen. The basic idea is to interview people have emigrated from their home countries to live in County Tipperary and to create a short news column, a long form read on the web, a compelling piece of audio and an image to accompany the story. The stories also go the other way, gathered from people who have left Ireland for other shores. I already have a dozen stories ready for creative multimedia students to illustrate, to set up for audio interview and to package in iBook and Kindle format. The overall idea is to demonstrate the value in storytelling. The business value will emerge as we propose A/B testing on a variety of paid subscriptions to the newspaper editor. Bernie Goldbach teaches electronic publishing. Bernie Goldbach on the road | Screenshot by Mia. FROM THE BACK seat comes requests to help pronounce words. 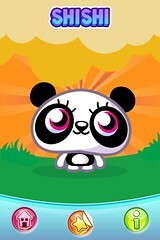 The Assignment: Know the names of every Moshi Monster. That's Shishi in the screenshot. When a Moshling emits a particularly entertaining squeal, his or her adorable face ends up in the photo gallery of my iTouch. And on special days like today, the Moshling gets a blog post. Last month, Moshlings got a slot at the Dublin Web Summit. Once I figure out how to record and share the sound of Shishi, I will add it to this blog post and engage our resident expert to explain other squealing Moshlings that she finds most adorable. Some are in her bedroom. Some have pride of place on the sitting room sofa. One hides in Mia's backpack. Sometimes, there's sibling strife when the youngest borrows one of his older sister's huggable Moshlings. It's all good fun. Bernie Goldbach hopes the kids start creating their own journals. Bernie Goldbach in Clonmel | Photo inside TippFM. I SPENT SEVERAL HOURS of creative time immersed in the study of cookies today. 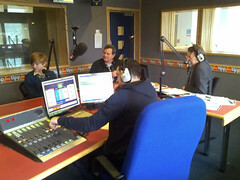 Part of that immersive experience took me into TippFM's studios. OperationCookie12 started as a tweet from our social media cadre in Clonmel, a web-savvy cluster of men and women who know their way around online communities. The Transition Year students from the Christian Brothers School in Thurles who participated in the taste test were asked to share their impressions of hand-made products from The Cookie Jar. We plan to roll several comments and images into promotional material for a new line of gourmet hampers available for international shipping. Part of the taste test went to the microphone of Tipp Today radio host Seamus Martin (in the one-o'clock position of the photo) and included the first on-air use of Audioboo (clip below).